Every year while returning to Kuwait from India during our vacation, we stop at Delhi. We just love Delhi. Delhi is beautiful. Delhi is irresistible. Even my five year brother keep asking, “ When are we going to Delhi? “ The power capital of the country Delhi is more than just a city. The rich heritage, culture, modernity, the ever loving Delhi Metro, ice cream at India Gate, our visit to Paratha Wali Gali and Chandni Chowk , dad’s favourite place- book market at Daryaganj and most importantly me and mom’s favourite shopping destination Janpath. The list is so long that I can go on and on. All these keep calling us back. It is perhaps one of the places with most number of historical monuments which is spread across the city and that lends a beautiful charm to it. 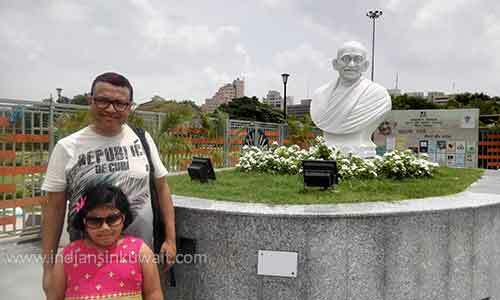 Delhi is an amazing place to explore India’s rich heritage and our parents make it a point to take us to few such places every year as we stop at Delhi. Last vacation while moving around Connaught Place we saw a big charkha. It caught my parent’s attention as it was something new to us and had not seen it during our previous visits. As we moved near it, we found it’s above Palika bazaar and opposite Khadi India. Infact it was the National Museum of Charkha inaugurated on 21 May,2017 . This museum is a window to the great heritage of Indian Charkha. The huge charkha outside the museum is 26 feet long (about 8 meters) and 13 feet (about 4 meters) high and weighs around 5 tonnes. 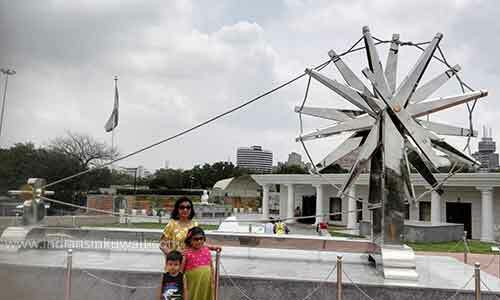 This charkha, the biggest in the world, is made of high quality stainless steel and is installed over an open platform area of 9 meter long and 6 meter wide. It is build in such a way so as to withstand all weather conditions such as sun, rain, fog, mist, hail storm etc. Apart from this huge charkha, you will get to see a beautiful big marble statue of Gandhiji and statue of the 3 monkeys…never see evil, never say evil, never hear evil outside the museum. As we enter the museum we got to see 50 to 100 year old charkhas donated by the owners of these charkhas, all of different size, style and designs. Charkhas used by Gandhiji, his pen and reading glass are also displayed. A host of old photographs and prints depicting the Swadeshi journey of Gandhiji and various snippets of the freedom struggle are also on display. The process of changing cotton to khadi is beautifully displayed and it attracted me. There are some details about how to use a charkha as well. Loved visiting the place and got the opportunity to spin a charkha at the museum……a memorable experience which will stay forever in my heart.